Published on July 11, 2012 in General T&T, Law, Politics, THA and Tobago. 5 Comments Tags: Politics, Stephen Kangal, T&T Govt. Current proposals originating both in POS (The Green Paper) and Scarborough (The Draft Bill of the THA) now in the public domain and geared to accord a higher level of self-governance to Tobagonians must not result in another façade Legislature exercising political and administrative autonomy merely to achieve peace, order and good governance in the sister-isle. There must be fundamental changes both in structure and substance. Tobago must be treated with dignity, the inalienable right of its people to self-determination respected and their ownership or sovereign rights over adjacent maritime resources to be exploited for the welfare of its people recognized and legitimized. Published on June 6, 2012 in General T&T, Media, Opposition Party, People's Partnership, PNM, Politics, THA, TOP and UNC. 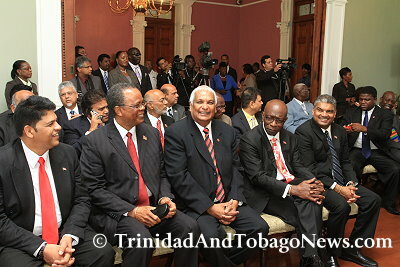 6 Comments Tags: Kamla Persad-Bissessar, Patrick Manning, Politics, Selwyn R. Cudjoe, T&T Govt. A few days ago, the People’s Partnership (PP) celebrated its second year of office amidst a lot of hype and propaganda. Their esteemed leader even tried to mamaguy Orville London by calling him “a bully and cry-baby” because, in his capacity as the Secretary of the THA, he sought a meeting with Kamla Persad Bissessar, in her capacity as the Prime Minister, to talk about the affairs of his country. Under normal circumstances, London would not necessarily have wanted to meet Persad Bissessar because there is nothing intellectually attractive or physically compelling about her. But such is the dynamics of power that the Prime Minister and her cohorts could say a lot of nonsense and get away with it because they control the political purse and constitutional discourses about the nation. Published on June 21, 2011 in General T&T, People's Partnership, PNM, Politics, Racism Watch, THA and Tobago. 1 Comment Tags: Dr Eric Williams, Kamla Persad-Bissessar, Politics, Selwyn R. Cudjoe, T&T Govt. A month ago the People’s Partnership (PP) celebrated its first anniversary. Its members party fuh so. Such was their glee that Kamla even found time to stick it to Orville London and the THA. Like all-conquering heroes and monarchs of everything they surveyed, not even the lowly CEPEP was beyond the grasps of their craven ways. They wanted it all. PP was not only of T&T; it envisaged itself as the all-embracing spirit of the society.